So I’ve been reading, yes, and even finishing a few more books since last post, but really, are any of them that great? I am not sure if it’s me, feeling depressed in the midst of a dreary winter–I kind of think it is, because I’m almost always excited about books. But I do wonder sometimes, is it me or the book that’s just “meh”? Have you ever felt like that? Sometimes I think it’s just bad timing and I miss a good book because I’m in the wrong frame of mind for it. It could be depression, or it could be unpleasant personal circumstances that the book reminds me of, or it could be “a bit of undigested tofu,” to slaughter Dickens. 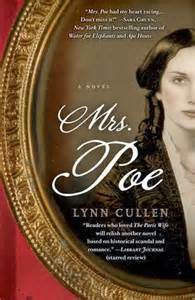 A friend loaned me Mrs. Poe by Lynn Cullen, ostensibly a fictional version of the real cousin of Edgar Alan Poe, whom he really married. At first I was into it, and I rather like the fragile, intense, strange creature that Cullen has created as Mrs. Poe. And that Mr. Poe is sick to death of everyone asking him to recite “The Raven,” a publishing sensation but far from his own favorite. Alas, I’m halfway through the book and I can stand no more. The problem is not Mrs. Poe, but the narrator, who is a woman trying to break into the literary circles of New York with little success. She meets Mr. Poe and is instantly smitten. I really hate it when people are smitten, don’t you? They seem to lose all self-respect. And perspective. So now all she does is obsess over Mr. Poe and her feelings towards him. Oh, and did I mention that she’s also married? No matter that her husband seems to have left her high and dry with two kiddies to raise alone. What’s worse is that Mr. Poe seems to return her feelings. Ugh. Why can’t we just focus on the weird relationship between Mr. and Mrs. Poe? That’s what I wanted to read. So, meh. Farewell, Mrs. Poe. I finished Doll Bones about a week ago and it was one of those books that felt extraordinary, but like a secret that no one else would understand. I felt like it spoke to me rather personally and that probably no one else would really get it. Which I know is wrong! Because it’s a popular book already (that’s how I found out about it) and so a lot of people are probably feeling the same way I did. Isn’t that funny how that works? 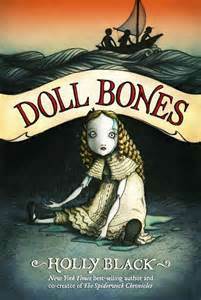 Doll Bones is a what I’d call a middle-grade novel. I was just talking to another Mom today about how so many middle-grade kids are reading young adult books now, but I think this is a standout in that it is about and would appeal to middle-grade kids. It’s about that transition you make from being a little kid to a bigger kid, to pre-teenage. But it doesn’t beat you over the head with the message that “aw, you’re growing up.” I’d like to peer into Holly Black’s mind to see how she comes up with such crazy adventures. There’s a creepiness factor that’s really fun in this story, and I like that she doesn’t resolve everything in the end. I mean, it’s resolved enough, but she doesn’t wipe away all the magic. The story is of three friends living in the same neighborhood who are in families with varying degrees of dysfunctionalism, and you’re just so glad they have each other to play with. Poppy, the youngest, is in awe of an antique porcelain doll that her mother keeps in a glass-fronted cabinet, not to be touched and certainly not to be played with (you picture Mom going on Antiques Roadshow, full of hope). Poppy and Zach and Alice all weave stories around this imaginary queen, using other dolls (and action figures) to play out their adventures. Zach’s father, who has been absent the last few years but recently moved back in, makes a serious misstep when he tries to grow up his son by chucking his favorite toys–the action figures he uses to play with Alice and Poppy. Dad thinks Zach is too old to be doing imaginary play. And of course he wants Zach to do more sports, to be manly (this is a parent I loved to hate, although he does eventually become more three-dimensional and less hateful). Zach is so upset with his father’s actions that he can’t even speak about it to Poppy and Alice because he’s afraid he’ll burst into tears. So he tries to pretend that he just doesn’t want to play anymore. In the end, [Zach] wasn’t sure if he went because he half believed in the ghost already or because he was used to following Poppy’s lead in a story or simply because leaving allowed him to run away and still believe he could come back. Their quest is not without its perils–creepy guy on the bus, police nosing around, a Huck Finn-worthy jaunt down a river, and much more. Breaking into a library was one of my favorite bits. And that doll is Miss Creepypants. She seems to move when no one is looking, and other people react to her presence as if she’s another child, the friends notice. For my Masters Thesis in school, I wrote a middle-grade novel, about this same kind of coming of age transition, with friendships changing. I haven’t looked at it since I graduated, because at the time I had a personal tragedy that sort of wiped out everything else. For the first time since then, reading this book made me want to go back to mine and work on it, to start the rewrite. That’s a big thing for me. Thanks, Holly Black. And I’ll definitely be reading more of your books!